We all have our favorite NFL and NBA players, each for different reasons. Some just like the best player, while others like a player for a certain uniqueness about them. Maybe you’re a big fan of defense, and your favorite player is the best defensive player in each sport. Well, I thought it would be fun to compare NBA and NFL players and see which players share similarities. I compiled a list of duos between the NFL and NBA that I thought were the most alike one another. Let’s start with one of the more obvious comparisons between the sports. These two are arguably the greatest to ever play their respective sport, and are still playing at a high level. Both have multiple championships and MVP’s. They aren’t quite what they used to be, and could be argued they aren’t the best player in the league anymore (though LeBron is a lot closer than Brady is), but they are still playing at a high level. Brady has reached his eighth straight conference championship game, while LeBron just went to his eighth straight NBA Finals last season. Both will go down as one of the greatest to ever play when it’s all said and done, and we have all been lucky enough to witness them both at the same time. This comparison is a little different than the first one, but it was too good to pass up. But of these guys dethroned the two above in championship settings (Eli beat Brady twice in the Super Bowl), and both are near the end of their careers. The Giants and Mavericks were both underdogs in their matchup with the Patriots and Heat, respectively. Both are going down as future Hall of Famers with great legacies left behind them, but will always be remembered for their championship performances. This is where the comparisons start getting interesting. These two players are great players, will go down as Hall of Famers, but have a couple knocks against them. Both never really had a whole lot of playoff success, as neither of them ever even played in the championship in their sport. Neither have won an MVP, but have been named to multiple All-Star teams/Pro Bowls. Their reputation will always be tarnished in someway due to their personal and team success, but they both are still great players. Okay, this one is pretty self-explanatory. Both players are extremely small in stature, but both are still excellent players. Sproles is well past his prime and has battled injuries as of late, but had some solid seasons, especially as a receiving back. IT now finds himself in a similar situation to Sproles, where he is still recovering from a serious injury, but just a few seasons ago was playing at an MVP-like level. This comparison was too obvious to pass up. This one is a little more debatable, but after thinking about it more, I like this comparison. Both are younger players who have yet to reach their peak, but are already serious candidates for the MVP trophy (Mahomes has his award pretty much locked up at this point). Both are taking the world by storm with their unique play style. Mahomes has made some incredible throws on the run, with the opposite throwing arm, and even without looking at his receiver. Giannis is just so long and unstoppable, and though the NBA is going to a more three-point-centric model, Giannis breaks that mold by driving and getting most of his points in the paint. These players have yet to reach their peak, so it’s scary to think what’s still ahead for these promising athletes. This was another obvious one. Both are rookies, both are awesome players. The comparison was pretty easy. Diving a little more into it, Barkley may already be arguably the most running back in the game. Doncic isn’t quite at that level, but it’s worth noting how much confidence he has for a 19-year old in the NBA. He is also second in All Star votes in the Western Conference behind only LeBron James, so his stardom is already on high notice. These two, like Mahomes and Giannis, have incredibly high expectations going forward. This one was a little tricky, but I think it will make more sense after I explain. Though Conner is fairly new to the league and Harden is a seasoned vet, both had similar experiences to get where they are at now. Harden was the glorified sixth man on a very good OKC team that lost in the Finals to the Heat. However, ever since he got his shot to start in Houston, he has been absolutely brilliant. He already has an MVP to his name, and is looking to add a second one this year with his current play. Conner was in a similar situation. He rode the bench all last season because he was behind LeVeon Bell, but as soon as Bell went into holdout mode, Conner stepped right in and was very impressive. Each started their careers off the bench, but when they got their shot, they did not disappoint. Oh, did I mention they have the same first name? This is another pretty obvious comparison between two great head coaches. Each have numerous championships to their name, as well as having coached a dynasty in their respective sport, which is something that you don’t see a lot in sports anymore. Both may retire here sooner rather than later, and both will go down as arguably the greatest coaches of all time. Here are two very bright-minded coaches who have had incredible success in their short time in the leagues. Both will be great for years to come, and are already considered to be one of the best coaches in their respective leagues. These will be prime candidates to be successors to the throne once Belichick and Popovich retire. 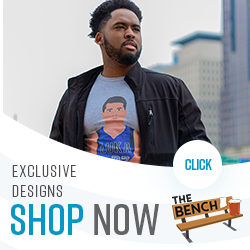 Check out our shop for exclusive sports and pop culture merch!